I always thought it would be really neat to have been able to see my boys race. Few people have the unique perspective of knowing and loving a dog as they watch it run with such passion and grace. I had heard that some of the greyhound tracks archive their race footage, so I started doing some digging. 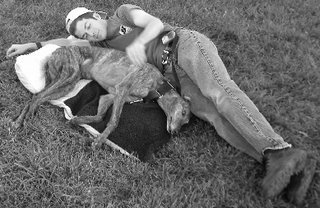 I went out to Greyhound Data to look at the race history for each of my boys. (I started with Bud since he is so recently off of the track. You can see Bud's history here and Hoss' history here.) In his last races, he was at Bluffs Run, and Greyhoud Data provided a link to their website. Turns out that they have video archives of their races for 2006! I checked Geneva Lakes, which is where Hoss raced last, and they have since closed and their website is gone. I'm bummed about that, seeing how Hoss was such a big racer (197 races! ), I thought it would be cool to have some footage of him racing. WOW!!! It was so cool to watch Bud run and win!!! I kept saying "Go, Buddy-boy! Go!!" I love it!!! I've included the video below. He is in box 6 with the yellow silk on. That is so cool!!! I have to see if Dairy Land has anything similar. 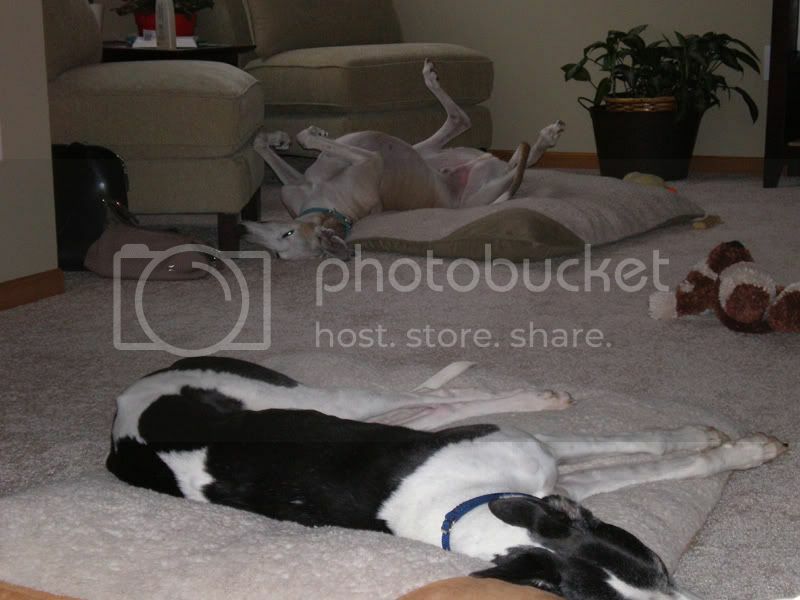 Your hounds were way above average in their racing careers. I've never heard of another retiree with over 100 races. There was a post recently on GreyTalk about video that is available for Dairyland. You can see that post here. Good luck! I hope you can find video of MLN. It is such a neat feeling! A big thanks for the Dairyland tip! How cool Chelle! I bet you have a whole new appreciation for what your boys have been through now! Have you found any video of Hoss? Can't wait to meet Bud over Thanksgiving! Rebecca - The place where Hoss raced has since closed down, so it will be tough to find any video. Plus, he has been retired a number of years now, and most tracks don't keep video for that long. Can't wait for you to meet Bud! You'll love him, too!